﻿ About Us – Matson Inc.
Matson, Inc. was founded in 1917 in Little Rock, Arkansas as the George H. Burden Company, Inc. Ownership of the company has continued in the same family since that time. Mr. Russell H. Matson, Jr. became the president of the company in 1947. Today, the company is owned and managed by his sons, Russell H. Matson, III and Charles B. Matson. 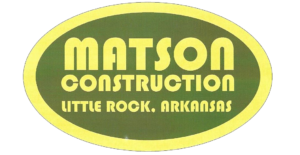 Matson, Inc. is not the largest contractor in Arkansas, but you would not know that by working with us. For almost 90 years, we have used a strong and effective management team, as well as quality craftsmen to establish a tradition of excellence which has earned recognition as an industry leader. With that knowledge and experience and our strict attention to detail, we are able to provide our clients with the quality projects they desire while maintaining the values and reputation that Mr. Russell Matson Jr. would expect. Matson, Inc.’s record of diverse projects range from large to small and include both public and private clients. From the Arlington Hotel in Hot Springs, Arkansas and the twenty-five story Worthen Bank Building (Bank of America) in downtown Little Rock to retail centers, branch banks, schools, religious facilities, and industrial projects throughout the state, we can handle all of your construction and development needs with ease. We invite you to take a look at you completed projects and, most of all, our record. Both will prove that Matson Inc. is one of the most respected General Contractors in Arkansas.